Lock in a great price for Denman Motor Inn – rated 9.1 by recent guests! Very clean and comfortable. Staff friendly and approachable. bed was very comfortable, important after a long drive! loved the shower!! The proprietors were very friendly and the bed was very comfortable. Our breakfast order was on time & very generous in quantity. Good sized room and bathroom, very comfortable bed, really quiet. Free wifi. A great location for a stay over on a two day trip. I have stayed in two other places in Denman, one was really noisy, the other had internal stairs (I have mobility problems). I then stayed here and have returned for last three years. The staff were so friendly. We arrived before check in time but our room was ready & we were able to go in straight away. We had two lovely nights there & wouldn't hesitate to book again. Awesome place to stay. Owners are lovely and only to happy to help. 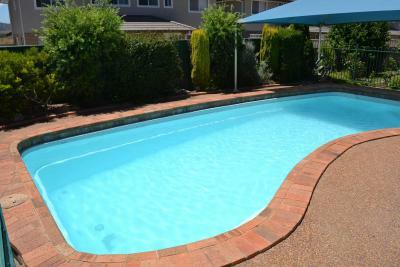 Perfect spot walking distance to town, rsl and restaurants. Rooms are welcoming and comfortable. Came up for a family wedding in the area. Location was great. Welcomed at office and found accommodation very comfortable. Loved the little touch of water and scaper to clean windscreen before leaving. Denman Motor Inn This rating is a reflection of how the property compares to the industry standard when it comes to price, facilities and services available. It's based on a self-evaluation by the property. Use this rating to help choose your stay! Offering free Wi-Fi, an outdoor swimming pool and free in-site parking, Denman Motor Inn is within 5 minutes’ walk of the local club, cafes, shops and restaurants. All rooms offer a flat-screen TV with satellite channels. Located in the Hunter Valley, Denman Motel is 10 minutes’ drive from Wollemi National Park. It is 20 minutes’ drive from Muswellbrook. Each air-conditioned room features a small refrigerator, a mini-bar and tea/coffee making facilities. Each includes an private bathroom with a shower, hairdryer and free guest toiletries. 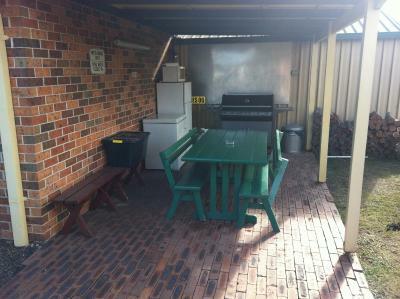 Guest can enjoy an outdoor meal using the BBQ area. There are local restaurants that can have your meal costs added to your accommodations bill. This property also has one of the top-rated locations in Denman! Guests are happier about it compared to other properties in the area. When would you like to stay at Denman Motor Inn? This air-conditioned room features a mini-bar, tea/coffee making facilities and TV with satellite channels. This air-conditioned family room has flat-screen satellite TV, a sofa lounge and a large bathroom. House Rules Denman Motor Inn takes special requests – add in the next step! Denman Motor Inn accepts these cards and reserves the right to temporarily hold an amount prior to arrival. Please note that there is a 4% charge when you pay with an American Express or Diners Club credit card. The location is good easy to locate booking was easy using on line booking aps. The room was clean and the beds were comfy. Bed beautiful and no noise! Quiet. Located close to eating places. Friendly staff.